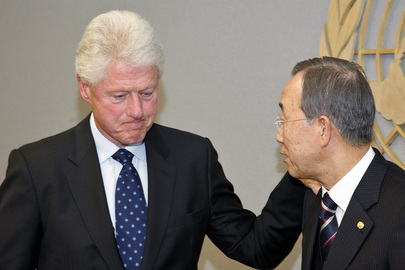 UNITED NATIONS, January 20 -- How aid to Haiti is being accounted for appears unclear. 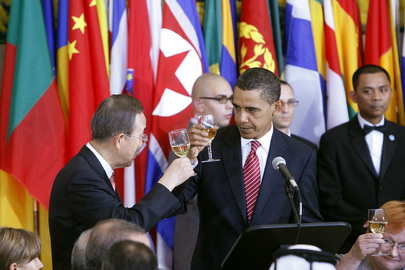 The UN has asked for $562 million; US President Barack Obama has announced $100 million in American aid. Inner City Press has asked both the UN and US whether Obama's $100 million will be part of the UN's $562 million flash appeal, and has received three different answers, none consistent with the UN web site. Inner City Press asked Deputy U.S. Permanent Representative Alejandro Wolff, who said on camera at the Security Council stakeout that "the one hundred million dollars that have been announced is bilateral contributions to the Haitian Government. We will also be contributing a significant amount to the Flash Appeal, which should be announced shortly." Video here, from Minute 4:24. Later, to its credit, the US Mission to the UN called Inner City Press and said this was not correct, that in fact $70 million of the $100 million announced by President Obama would be part of the UN flash appeal. For this proposition, the US Mission helpfully sent a link to the UN web site. The difficulty is that the UN's "List of all commitments / contributions and pledges as of 20 January, 2010," numerous US pledges and expenditures are listed and counted, some of which are explicitly labeled "bilateral," and $36 million of which are USFEMA search and rescue. Click here for the UN link, here for copy saved by Inner City Press as it appeared on the afternoon of January 20, 2010.
sniffer dogs" -- which came by air from China less than three hours after the earthquake. Similar flights and food from Brazil, Chile, Colombia, Greece, Iran, Israel, Mexico, Netherlands, Nicaragua, Panama, Paraguay, Peru, Philippines, Poland, Portugal, the UAE, South Africa, "Taiwan (Province of China)" and Canada are also given zero value as of January 20. Canada's "Disaster Emergency Response Team deployed to Haiti; C-17 aircraft full of medical aid and a pair of search and rescue helicopters" is, as of January 20, valued at zero by the UN. So are 60 Cuban doctors. For France Morocco and South Korea, on the other hand, every listed item is given a dollar value. On January 20, Inner City Press asked top UN humanitarian John Holmes about this. Before the press conference monitor cut the questions off, Holmes said that "we depend on member states to give us [information]...they will decide, they don't give to us." Video here, from Minute 23:31. To a skeptic it appears that both the UN and the Obama Administration want to make it appear that unlike previously, the US is now working through the UN. But the American funds listed on the UN web site, to which the US Mission to the UN referred Inner City Press, are nearly entirely bilateral, or even simply US expenditures on, apparently, its own administrative costs ($70,930). Back on January 15, Inner City Press asked UN Secretary General Ban Ki-moon if there would be an independent watchdog -- to audit and report on how aid is spent, and if donors following through on their loud pledges. Mr. Ban replied that "there needs to be some transparency as well as accountability on how this money should be effectively and properly used. That we will discuss later." That "later," it would seem, has arrived. The time is now. Footnote: also listed by the UN as contribution are tabacconist Philip Morris' parent company Altria, multi level marketing concern Amway, the "Build a Bear Workshop Foundation," $3000 from Burger King, Dollar General Corporation, food speculator Cargill, Go Daddy -- a cynic wondered, why not Moussa Dadis Camara? UNITED NATIONS, January 15 -- UN Secretary General Ban Ki-moon, in his third day in a room of addressing the Press about Haiti, declined to Friday to provide casualty figures, leaving that for his spokesman Martin Nesirky. Inner City Press asked Mr. Ban, in light of his call that all aid be "coordinated" through the UN, whether the $100 million announced by U.S. President Barack Obama will be part of the UN's $550 million flash appeal. Mr. Ban answered that giving money NOT through the UN is a decision that any sovereign government can make. Only yesterday, he said that increased U.S. military presence in Haiti would be coordinated with the UN, or as some reporters heard it, under UN control. Already, there is a call for an independent aid monitor. Inner City Press asked Ban about the idea. Ban said yes, there is a need for transparency, the idea will be studied. Notably, after Cyclone Nargis in Myanmar, the UN allowed millions of dollars in aid to be taken by the Than Shwe government, as exposed by Inner City Press. The UN at first denied it, then admitted it, then later downplayed it. Nesirky came back after Ban and took very few questions. The paper of record asked about visits to national staff members homes, which the Deputy SRSG described in response to Inner City Press' question on January 15, but only as to UNDP. Nesirky said the visits are continuing. But are the peacekeeping mission's national Haitian staff all being visited? In terms of now 38 deaths among the "UN presence in Haiti," on January 14 the briefers from Haiti said that deaths are only listed once families are informed, which is coordinated through UN headquarters in New York. But is that the process for national Haitian staff? Nesirky took no more questions. So here's another: what about contractors who worked for the UN? At UN headquarters in New York, the cooking and cleaning and even UN TV is done by contractors, many of whom have worked in and for the UN for more than a decade. But such contractors would not show up or be counted, as the UN is doing it. Watch this site.